The season is shifting from the depths of winter to the first stirrings of spring. Now is the time to finish planting wildflowers that need only a month of stratification & start planting native grasses. Food and homes for pollinators broaden their habitat and invites them into our spheres. 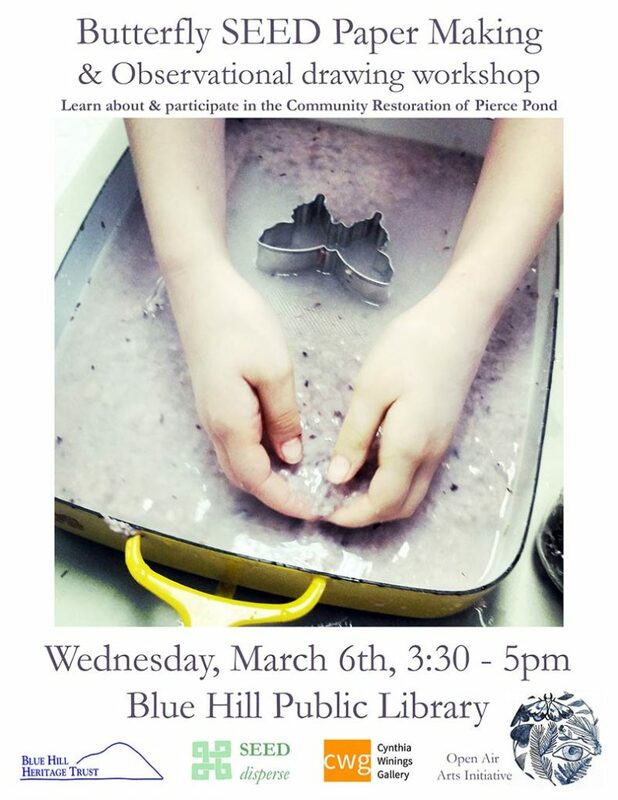 Join us on March 6th at the Blue Hill Public Library to pick up free seed, learn about the restoration of Pierce Pond and make work for the community art installation which will be installed at the new fish ladder and outdoor classroom as part of the creative restoration process. Participate in the Community Restoration of Pierce Pond through March by sowing native seeds specific to the river and lakeshore plant communities observed around Pierce Pond and gathered from the research in the Natural Landscapes of Maine guide published by the Maine Heritage Fund. Seeds are best sown at home, and we invite community members to establish some in their home gardens and sow some to share with the restoration project. Join us for a series of events through the autumn as we explore relationships between birds, seeds and ourselves. Bringing sculptural considerations from the above workshop out into the field on a larger scale, the Blue Hill Heritage Trust is inviting the public to participate in a “community weaving” in the Kingdom woods as part of the Great Maine Outdoor weekend. We are restoring a blueberry field by clearing trees and scrub brush. This in turn will provide material to create sculpture woven through the landscape while also providing shelter for overwintering birds. The growing season has come forth in earnest as we dig in to our third year restoring the land around the 1835 Cheever built farmhouse on Conary Cove. With five distinct ecology zones, we are cultivating plant communities that demonstrate the native ecological systems in this region, which is one of the most ecologically diverse on the planet. Visitors to the SEED Barn may tour the restoration work under way in the gardens, take some time with the garden book library and peruse the SEED Sensorium. Artwork on display is by local artisans, the original SEED :: disperse artists as well as by members of the Atis Rezistans who maintain a parallel SEED project in Central Port Au Prince, Haiti. Following the ecological rhythm of the seasons, SEED programs engage a network of schools and land stewards at the intersection of art and ecology to promote long term restoration. Building habitat for birds and pollinators through providing accessible platforms for community participation develops a sense of our relationships with the natural world, which we feel is essential to the effectiveness of conservation work. 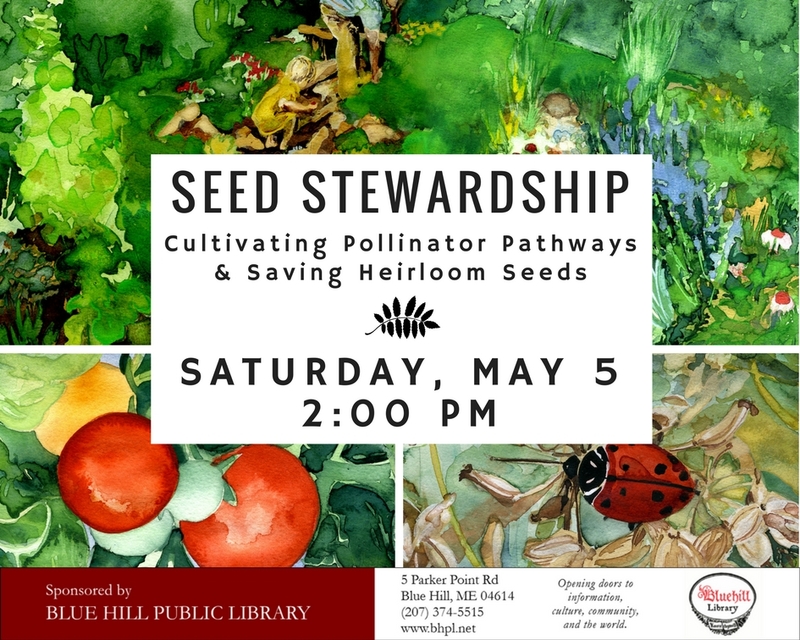 Bridging art, science and community engagement, local artist Lee Lee founded the SEED Barn in South Blue Hill as an incubator for creative dissemination methods to preserve heirloom seeds and restore habitats in both Haiti and Maine. SEED is an interdisciplinary arts project exploring and celebrating the miracle of the seed. The SEED Mission is to encourage cross-pollination between the arts and sciences through fine art exhibitions and creative dissemination methods in combination with multi-sensory and educational SEED Sensorium. Visitors to SEED are invited to look through the lens of the seed to explore connections between art and science and their personal relationship to the natural world. Initiated during the 4th Ghetto Biennial, the Gardens of the Grand Rue project responds to food justice issues through heirloom seed preservation, cultivation and education. Debris is an interactive, collaborative installation which is being created as a response to problems presented by marine debris, with a focus on single use plastic. The work reflects the literal problem of plastic in marine environments while offering a symbolic representation of the chemical body burdens carried by wildlife and humans alike. In presenting these issues, we are asked to consider misplaced cultural notions of “disposability”, calling in to question consumer driven waste which has devalued what is in fact a very important material.